We are all very careful to buy exactly the product that we are happy with and in the case of our herbal tobacco or culinary herbs and spices, and the last thing that we want is for them to become tainted in any way. Manufacturers take great care to ensure that the product reaches us in perfect condition, so why not store it so that it remains just the same? 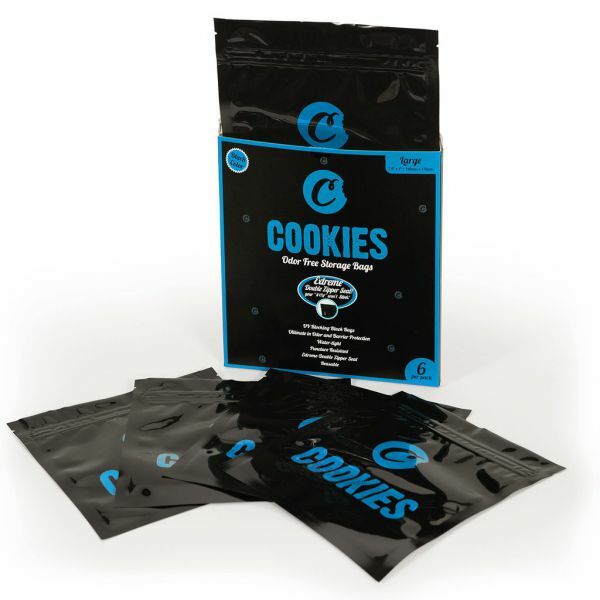 This is now easily achievable with the aid of these great Cookies Odor Free Storage bags, offered by us in three handy sizes, Extra Large: 215mm x 255mm in packs of 6, Large: 190mm x 178mm, again in a 6 pack and Medium: 102mm x 152mm which we supply in 12 pack size. The bags are very strong; they are also perfectly water tight so accidental spillage will not affect the product, added to which the material is puncture resistant. You will find that the edges are extreme sealed and have a triple pressed thick seal, plus the great durable locking zipper is three times thicker and softer than a regular bag and will definitely block out odours every time, preventing the product becoming tainted. These bags are on offer now from as low as £7.99, and can be re-used if needed. You may be going to a music festival or similar event and we all know what happens at these festivals when we are having fun, the heavens open and it rains! So how do you keep your precious herbal mixture clean and dry and also prevent the smells of the strong herbal mixture from escaping? Well the answer lies in one of the range of baggies that we offer and, Stink Sacks as we fondly refer to them are just perfect for this as well as keeping other items in perfect condition, in the kitchen perhaps for storing garlic, preventing the pungent smell from escaping as well as maintaining freshness. The sacks are strong and will withstand plenty normal use including festival fun, made from tough puncture resistant Polyethylene; they have extra thick seals around the edges to prevent tearing. The stink sack is available in a variety of different designs, clear if you wish as well as Black, Camouflage, Leopard and of course Skulls. 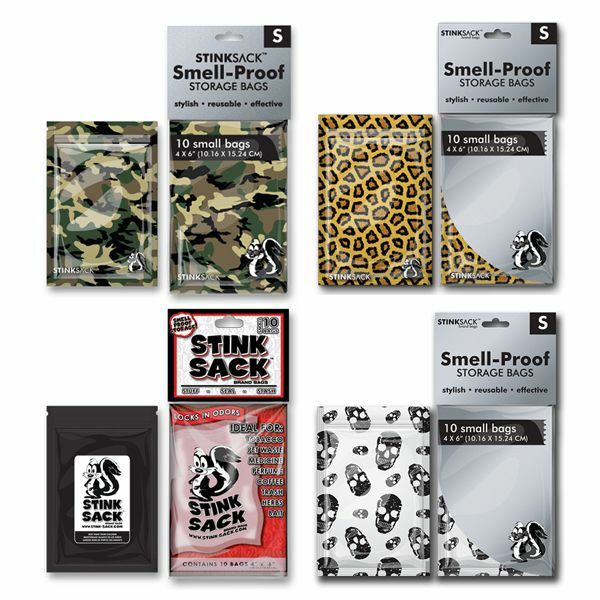 Each Stink Sack Small 10 pack contains 10 re-usable individual smells proof storage bags of your chosen design that measure 4 x 6 inches. Starting at just £6.99 for ten, your herbs, or tobacco, will remain fresh and in perfect condition, a small price to pay when you get caught up in that fun packed rain storm. Need some storage for smelly herbs and spices but don’t want to fork out for some airtight jars, then you need some Smelly Proof Bagies. These inexpensive baggies are available in a range of different sizes from extra extra small to extra-large meaning that you can store just about anything pungent away. Smelly Proof Baggies are made from puncture and tear resistant plastic and once sealed no smell will get out making them ideal for any herbs or spices; it will also keep them fresh too! Smelly Prof Baggies are available now from just 45p each. Keeping your smoking accessories clean and dry can be quite hard, especially if you’re at a festival or outdoor party, but Smelly Proof Baggies are specially designed to keep all of your accessories safe and dry, as well as locking in the freshness and smell. Smelly Proof Baggies are available in a range of sizes between extra extra small and extra large and are great for putting some of your smellier herbal mixes in. Once the bag is sealed you can be sure that your mixtures will stay dry and not smell the place out. 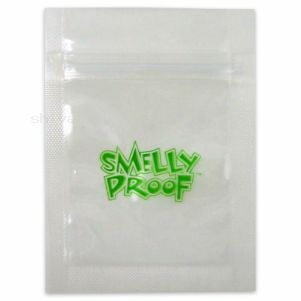 Smelly Proof Baggies are made from puncture and tear resistant plastic and can be used over and over again. Get yours today with prices starting from just 45p each. 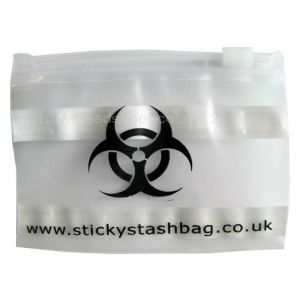 Sticky Stash Bags are ideal for keeping your personal items safe and hidden from preying eyes and fingers. They are great for keeping small items like money, ID Cards, Credit Cards and medicine safe and secure when you’re out and about. Sticky Stash Bags are designed to stick to the inside of your clothes; they are single use but ideal for keeping your precious items safe for the whole day. The back of the Sticky Stash Bags have an adhesive surface that you can stick to the inside of clothes, hats or bags. Each pack contains 4 Sticky Stash Bags and at £2.99 a pack they are a great security measure to have when you’re at big gatherings such as music festival, gigs or open air events.